Gustav II Adolf (December 9, 1594 – November 6, 1632) (Gustav II Adolphus, widely known in English by the Latinized name Gustavus Adolphus and variously in historical writings sometimes as simply just Gustavus, or Gustavus the Great, or Gustav Adolf the Great, from the special distinction passed by the Swedish Parliament in 1634) was founder of the Swedish Empire (or Stormaktstiden—"the era of great power") at the beginning of what is widely regarded as the Golden Age of Sweden. In the era, which was characterized by nearly endless warfare, he led his armies as King of Sweden—from 1611, as a seventeen year old, until his death in battle while leading a charge during 1632, in the bloody Thirty Years’ War—as Sweden rose from the status as a mere regional power and run of the mill kingdom to one of the great powers of Europe and a model of early modern era government. Sweden expanded to become the third biggest nation in Europe after Russia and Spain within only a few years during his reign. Some have called him the father of modern warfare, or the first great modern general. He is, and was even during his own time, widely regarded as the archetype of what a king should be and one of the few European kings and sovereign princes during the seventeenth century worthy of the office. (The Italians referred to him as "The Golden King" and others as "The Lion of the North.") He was, unquestionably, one of the greatest military generals in all of history, and his battles were studied assiduously by later great military figures. He did not have a legitimate male heir, however, and was succeeded by his daughter Christina of Sweden. Abdicating in 1654, she was the last ruler from the house of Vasa. While his military tactics are still admired, perhaps the most significant aspect of his legacy is that he left Swedes a self-confident people, who, from their secure and increasingly prosperous nation-state, turned away from militarism in the eighteenth century, to emerge as one of the most philanthropic, peace-affirming people in the world. As a modern day supporter of the peace keeping activities of the United Nations and a major donor in the fields of aid and development, Sweden is committed to achieving an equitable and just world for all people. Gustavus Adolphus laid a solid foundation for Sweden's economy to flourish within safe and secure borders, from which Swedes looked out at a wider world, increasingly aware that humanity has a shared responsibility towards the welfare of all who live on the planet. Gustavus Adolphus was born in Stockholm as the oldest son of King Charles IX of Sweden of the Vasa dynasty and his second wife, Christina of Holstein-Gottorp. Upon his father's death in 1611, a seventeen year-old Gustav inherited the throne, as well as an ongoing succession of occasionally belligerent dynastic disputes with his Polish cousin, Sigismund III of Poland, who in the preliminary religious strife before the Thirty Years' War, was forced to let go of the throne of Sweden to Gustav's father. Sigismund III wanted to regain the throne of Sweden and tried to force Gustav Adolph to renounce the title. 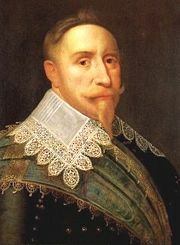 In a round of this dynastic dispute, he invaded Livonia when he was 31, beginning the Polish-Swedish War (1625–1629). He intervened on behalf of the Lutherans in Prussia, who opened the gates to their cities. His reign became famous from his actions a few years later when in June 1630, he landed in Germany, continuing Sweden's involvement in the ongoing Thirty Years' War. Gustavus intervened on the anti-Imperial side, which at the time was losing to the Holy Roman Empire and its Catholic allies; the Swedish forces would quickly reverse that situation. He was married to Maria Eleonora of Brandenburg, the daughter of John Sigismund, Elector of Brandenburg, and chose the Prussian city of Elbing as the base for his operations in Germany. He died in the Battle of Lützen in 1632. His early death was a great loss to the Lutheran side, it prolonged the war for many years. It resulted in large parts of Germany and other countries, who for a large part had become Lutheran in faith, to be forced into Catholicism (via Counter-Reformation). His involvement in the Thirty Years' War gave rise to the old prophecy that he was the incarnation of "the Lion of the North," or as it is called in German "Der Löwe von Mitternacht" (Literally: "The Lion from Midnight"). Gustavus Adolphus was known as an able military commander. His innovative tactical integration of infantry, cavalry, artillery and logistics earned him the title of the "Father of Modern Warfare." Future commanders who studied and admired Gustav II Adolf include Napoleon I of France and Carl von Clausewitz. His advancements in military science made Sweden the dominant Baltic Baltic power for the next one hundred years. He is also the only Swedish monarch to be styled "the Great." This decision was made by the Swedish Estates of the Realm, when they convened in 1633. Thus, by their decision he is officially, to this day, to be called Gustaf Adolf the Great (Gustavus Adolphus Magnus). Gustavus Adolphus was the main figure responsible for the success of Sweden during the Thirty Years' War and led his nation to great prestige. As a general, Gustavus Adolphus is famous for employing mobile artillery on the battlefield, as well as very aggressive tactics, where attack was stressed over defense, and mobility and cavalry initiative were emphasized. Among other innovations, he installed an early form of combined arms in his formations where the cavalry could attack from the safety of a infantry line reinforced by canon, and retire again within to regroup after their foray. He adopted much shallower infantry formations than were common in the pike and shot armies of the era, with formations typically fighting in 5 or 6 ranks, occasionally supported at some distance by another such formation—the gaps being the provinces of the artillery and cavalry as noted above. His artillery were themselves different—he would not let himself be hindered by cumbersome heavy cannon, but instead over a course of experimentation settled on smaller more maneuverable weapons, in effect fielding the first light field artillery in history in any significant ratios. These grouped in batteries, supported his more linearly deployed formations, the whole in his armies replaced the cumbersome and unmaneuverable traditional deep squares up to 50 ranks deep (Spanish Tercios), used in other pike and shot armies of the day. In consequence, his forces could redeploy and reconfigure extremely rapidly confounding his enemies. His armies were very well trained for the day, so that his musketeers were widely known for their firing accuracy and reload speed: Three times faster than any contemporary rivals. Carl von Clausewitz and Napoleon Bonaparte considered him one of the greatest generals of all time—a sentiment agreed to by Patton and others. He was also renowned for the consistency of purpose and the amity of his troops—no one part of his armies were considered better or received preferred treatment as was common in other armies where the cavalry were the elite, followed by the artillerist, and both disdained the lowly infantry. In a Gustavus' army, the units were extensively cross trained. Both cavalry and infantry could service the artillery—as his heavy cavalry did when turning captured artillery on the opposing Catholic Tercios atBreitenfeld; pikemen could shoot—if not as accurately as those designated musketeers so a valuable firearm could be kept in the firing line, and his infantrymen and gunners were taught to ride, if needed. Napoleon thought highly of the achievement, and copied the tactics. When Gustavus Adolphus began his push into northern Germany in June-July 1630, he had just 4,000 troops. But he was soon able to consolidate the Protestant position in the north. Meanwhile, a Catholic army was laying waste to Saxony. Gustavus Adolphus met and defeated it at the First Battle of Breitenfeld in September 1631, in spite of the collapse of his Saxon allies. He then made plans for the invasion of the rest of the Holy Roman Empire. In March 1632, Gustavus Adolphus invaded Bavaria. He forced the withdrawal of his Catholic opponents at the Battle of Rain. This would mark the high point of the campaign. In the summer of that year, he sought a political solution that would preserve the existing structure of states in Germany, while guaranteeing the security of its Protestants. But achieving these objectives depended on his continued success on the battlefield. Gustavus Adolphus was killed at the Battle of Lützen, when, at a crucial point in the battle, he became separated from his troops while leading a cavalry charge into a dense smog of mist and gunpowder smoke. After his death, his wife initially kept his body, and later his heart, in her castle for over a year. His remains (including his heart) now rest in Riddarholmskyrkan in Stockholm. Up to the time of his death, Gustavus Adolphus had incurred 13 prior wounds in battle. In February 1633, following the death of the king, the Swedish Riksdag of the Estates decided that his name would be styled Gustav Adolf the Great (or Gustaf Adolf den Store in Swedish). No such honor has been bestowed on any other Swedish monarch since. The crown of Sweden was inherited in the Vasa family, and from Charles IX's time excluded those Vasa princes who had been traitors or descended from deposed monarchs. Gustavus Adolphus' younger brother had died years before, and therefore there were only female heirs left. Maria Eleonora and the king's ministers took over the government on behalf of Gustavus Adolphus' underage daughter Christina I of Sweden upon her father's death. He left one other known child, his illegitimate son, Gustav, Count of Vasaborg. The German Socialist Franz Meharring (1846–1919) wrote a biography of Gustavus Adolphus with a Marxist perspective on the actions of the Swedish king during the Thirty Years' War. In it, he makes a case that the war was fought over economics and trade rather than religion. Gustav II Adolf's success in making Sweden one of the top nations in Europe, and perhaps the most important nation in the Thirty Years' War, was not only due to military brilliance but large changes in the Swedish system of government. For example, he was the creator of the first central bank in the world, Riksbanken, and the first in the world to start with Parish registration. July 1626. Gustavus Adolphus and his army disembark at Pillau, Prussia, during the Polish-Swedish War (1625–1629). August 18, 1627. The King is seriously wounded in the battle of Dirschau (Tczew). June 1629 his troops meet up with imperial troops under Hans Georg von Arnim-Boitzenburg, who used to serve under Gustav Adolph, and is ordered by emperor Ferdinand to aid Sigismund III. May 1630 and July 6 Gustav Adolph lands in Germany. September 1631. At the Battle of Breitenfeld, Gustavus Adolphus decisively defeats the Catholic forces led by Johann Tserclaes, Count of Tilly, even after the allied Protestant Saxon army had been routed and fled with the baggage train. September 1632. Gustavus Adolphus attacks the stronghold of Alte Veste, which is under the command of Albrecht von Wallenstein, but is repulsed, marking the first defeat in the Thirty Years' War of the previously invincible Swedes. This leads to defection of some mercenary elements in the Protestant army. November 1632. At the Battle of Lützen, Gustavus Adolphus is killed but the Swedes win the day, thanks to Bernhard of Saxe-Weimar, who assumed command, and defeat Wallenstein. The Swedish war effort was kept up by generals Gustav Horn, Count of Pori, Johan Banér, Lennart Torstenson and chancellor Axel Oxenstierna until the Peace of Westphalia. Gustavus Adolphus Day is celebrated in Sweden each year on November 6. On this day only a special pastry, with a chocolate or marzipan medallion of the king, is sold. The day is also an official flag day in the Swedish calendar. In Finland, the day is celebrated as svenska dagen or ruotsalaisuuden päivä, "Swedishness Day," and is a customary flag day. In both countries, November 6 is the name day for Gustav Adolf, one of the few exceptional name days in the year. Gustavus Adolphus plays an important supporting role in Eric Flint's 1632 series, living beyond his battle death after being warned by the Americans, fitted with eye-glasses, and becomes Emperor of the United States of Europe. G. A Henty wrote The Lion of the North: A Tale of the Times of Gustavus Adolphus originally published in 1885. Known as the "Father of Modern Warfare," Gustavus Adolphus' innovative battlefield tactics were renounced for their ingeniousness and would prove valuable in their time as well as in future militaristic conflicts. His techniques helped to bring Sweden out of the Thirty Years' War and bestow upon the country prominence won on the battlefield. His armies were finely trained. Speed was key in the heat of battle, as troops were instructed to quickly fire and reload their weapons. Fair treatment was exercised among the ranks, a practice that was novel among armies at the time. Also unique to Gustavus Adolphus' army was the instruction of artillery, cavalry, and infantry in the disciplines and duties of one another so as to provide for an army of cross trained soldiers, adept at fighting in any style and partaking in interchangeable positions as necessitated by the course of the conflict in which they were currently participating. He favored striking on the offense rather than taking the defensive approach to battle, as was common at the time, which added to his success and valor. The novel militaristic practices of Gustavus Adolphus were admired in his time, earning him great fame and acclaim in his kingdom as well as throughout other parts of the world. His skills would be put into practice and renowned by future military men of great success, among them Clausewitz, Napoleon, and Patton. Clearly, Gustavus Adolphus was an important figure whose innovative style and tactics on the battlefield would help him live in infamy far after his death on the battlefields of Lützen. Soldiers such as Napoleon Bonaparte; Arthur Wellesley, 1st Duke of Wellington; Carl von Clausewitz; and Patton studied his battles, which are still taught in military science courses today. Gustavus Adolphus is today immortalized in two city squares, one in Stockholm and the other in Gothenburg, both named in Swedish Gustav Adolfs torg. Christina succeeded him as Queen. She abdicated in 1654 in favor of her cousin, resisting pressure to marry and give birth to an heir. Christina was the last Swedish ruler from the House of Vasa. Before she abdicated, she launched Sweden's short-lived but important overseas empire, founding colonies in North America. Arguably, it was because her father had secured Sweden's borders, and raised Sweden's status in Europe, that Sweden could now venture further afield across the oceans of the world, developing trade and commerce. Perhaps one of the most important aspects of Gustavus Adolphus's legacy is that by establishing Sweden as one of Europe's leading nations, he opened Swedish eyes to the world beyond the Baltic. In the early eighteenth century, Sweden switched from from concern to be a military power to a position of neutrality. This switch had significant consequences for the way in which Sweden viewed her role in the world. Instead of wanting to dominate the world as a great power, although this had certainly played a role in her earlier self-understanding and was very much a concern of Gustavus Adolphus, Sweden became more interested in spreading Enlightenment values. In the post-World War II context, in proportion to her Gross National Product, Sweden has been one of the highest contributors to aid and development. The legacy of empire, begun by Gustavus Adolphus and continued during his daughter's reign, who acquired overseas colonies, left Sweden with knowledge of and interest in other parts of the world, which has translated into concern for issues of global justice and peace making Sweden one of the most active countries in supporting United Nations peace keeping activities. Swedes did not inherit attitudes of racial and cultural superiority from the colonial period (they lost or sold their possessions at an early date) that have complicated the way in which some former colonial powers view the rest of the world, as, despite the end of colonialism, a theater for the pursuit of their own interests and agendas. Nor has Sweden favored former colonial territories in its aid program, since links that did exist are too distant in time to have any continued claim. ↑ Peter Englund, Ofredsår: om den svenska stormaktstiden och en man i dess mitt (Stockholm: Atlantis, 1997, ISBN 9789174863499). ↑ Eric Flint, 1632 (Riverdale, NY: Baen, 2000, ISBN 9780671578497). Brzezinski, Richard. 1993. The Army of Gustavus Adolphus. Oxford, UK: Osprey Publishing. ISBN 1855323508. Dupuy, Trevor Nevitt. 1969. The Military Life of Gustavus Adolphus, Father of Modern War. New York: F. Watts. ISBN 9780531018781. Fletcher, C. R. L. 2005. Gustavus Adolphus and the Struggle of Protestantism for Existence. Whitefish, MT: Kessinger Publishing. ISBN 9781432617486. Harte, Walter. 1759. The History of the Life of Gustavus Adolphus, King of Sweden. London, UK: G. Hawkins. Henty, G. A., and John Schönberg. 2000. The Lion of the North: A Tale of the Times of Gustavus Adolphus. Mill Hall, Pa: PrestonSPeed Publication. ISBN 9781887159432. Mehring, Franz. 1982. Gustav II Adolf. Göteborg: Proletärkultur. ISBN 9789173840279. Roberts, Michael. 1958. Gustavus Adolphus: A History of Sweden, 1611-1631. New York, NY: Longmans. Roberts, Michael. 1973. Gustavus Adolphus and the rise of Sweden. London: English Universities Press. ISBN 9780340124147. History of "Gustavus Adolphus of Sweden"
This page was last modified on 6 August 2016, at 20:42.